What should be the future priorities for ICT4D policy and practice? And what should guide the World Summit on the Information Society process – the global node for ICT4D policy and practice – beyond 2015? The post-2015 development agenda will be the single most-important force shaping the future of international development and, hence, the single most-important force shaping the future of ICT4D. In this entry, I summarise the findings from a recent working paper: “ICT4D 2016: New Priorities for ICT4D Policy, Practice and WSIS in a Post-2015 World”. This presents results from a content analysis exercise which compared the content of the post-2015 development agenda against the content of nearly 1,000 pages of ICT4D-related text gathered from WSIS+10 review and vision activities. The basic comparison is shown in the figure below. It provides a measure of “ICT4D gap” by plotting the extent of difference between the post-2015 text and the WSIS+10 documentation; aggregated into a set of development issues. Issues above the line are more highly represented in ICT4D than in the post-2015 agenda; issues below the line are less highly represented. The larger the indicator the greater the over- or under-representation. This chart plus a whole set of other analytical data (see online paper for details) produce the ICT4D priority map shown below. Laterally, it sorts issues in terms of their relation to development. Mainly by type of goals – environmental, economic, social, political, or cross-cutting – but also including development mechanisms, of which ICT itself is one. Vertically, it sorts issues in terms of gap. 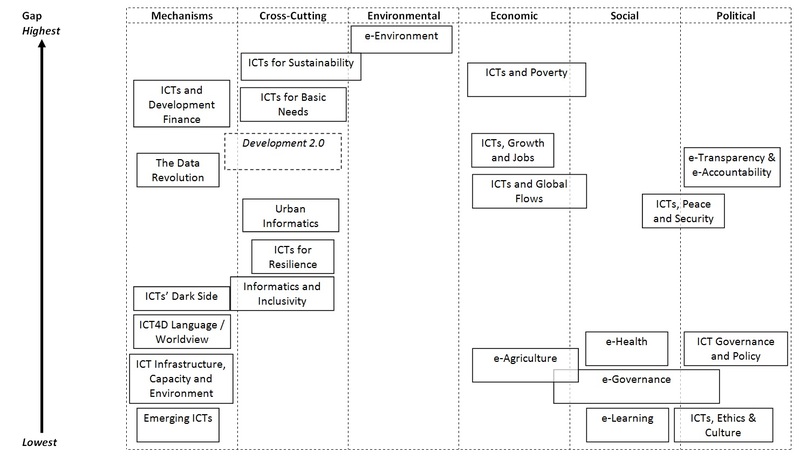 The higher up the diagram a topic appears, the greater the gap between its presence on the post-2015 agenda and its presence in current ICT4D policy/practice as exemplified by WSIS. The larger the gap, the greater the need for additional attention to be paid to that topic. Put another way: in reshaping future WSIS priorities specifically and ICT4D priorities more broadly, there is a logic in starting at the top of the figure. Further details about the topics identified in the map can be found in the online paper. Around the time of the MDGs, ICT4D became the focus for a critical mass of activity; a “sidestreaming” approach that saw specialist ICT4D units arise in a number of international and national organisations. Following the 2005 World Summit on the Information Society (WSIS), this was largely mainstreamed with specialist units being disbanded or shrinking, and ICT4D expertise seen as diffused into the main development sectors. There is a logic to mainstreaming – if done right – in ensuring integration of ICTs into a broad range of development goals. But there are also many dangers of just mainstreaming, as I have previously summarised: you lose the focus for learning about ICT4D; you hide or downplay technological innovation which can be a source of motivation and hope, and a lever for change; you lose sight of the ICT sector and digital economy roles in development; you silo ICT into individual development sectors and thus miss the technology’s cross-cutting, integrative capabilities; and there is no “Development 2.0” or other vision for ICTs as a force for transformative change. So alongside mainstreaming, there needs to be some sidestreaming: retaining and supporting specialist ICT4D units within … the UN system overall; individual UN organisations; international development agencies; national development agencies; national governments; international NGOs; etc. But ICT4D seems to spend more time making arguments for mainstreaming than for sidestreaming: in a recent analysis of WSIS+10 documentation, mainstreaming was found to be mentioned on a fairly regular basis but the need for sidestreaming – very much present if one cared to draw it out – was only implicit. The case for specialist concentrations of expertise will require evidence of the past benefits of, and continuing future necessity for, sidestreamed structures at all levels within development. That should associate the value of sidestreaming just identified – learning, motivation, hope, change, ICT-based livelihoods, integration, transformation, etc – not just with the positive impacts of ICT4D but also the negative: as development becomes ever-more digital, we will require a focused effort to address ICT’s dark side. As noted, this applies at various levels but the structuring at the level of the UN system mirrors that one would find at the level of individual countries and organisations. Essentially you have a technology-focused structure – the International Telecommunication Union (ITU) in the case of the UN; equivalent to a Ministry of ICT at national level or the IT department at organisational level. Its future is never in doubt and it remains the bastion of sidestreaming. But these structures have a problem: they are full of engineers with a techno-centric worldview who find it difficult to understand development language and concepts. We can characterise the issue in terms of the ICT4D value chain. Technical structures are good at dealing with the technical components of ‘readiness’, and the technical deliverables of ‘availability’. But they are not so good at dealing with the non-technical elements of both stages, nor with the issues of ‘uptake’ and ‘impact’. That would be a problem in itself but it is exacerbated because, over time and as ICT diffuses ever-further into international development, there is a shift in focus from just being concerned about readiness and availability to being equally – if not more – concerned with uptake and impact. The solution here is that, over time, one places less emphasis on technical personnel and technology-dominated structures, and greater emphasis on ICT4D hybrids: socio-technical people and structures who combine an understanding of informatics (data, information, ICTs, information systems) with an equal understanding of development. In theory, the UN system has this via the UN Group on the Information Society, which was set up in 2006 in the wake of WSIS 2005 to draw together those with ICT4D interests and responsibilities from across the UN system. However, the extent to which UNGIS members are actually hybrids is unclear, and more generally, UNGIS seems to have limited power and reach in part due to its lack of independent resources. So what of the future for ICT4D structures in the UN system? One could argue for a hybridisation of the ITU: a broadening of its scope to turn it from a technical into a socio-technical organisation that can cover all parts of the ICT4D value chain. But that could be self-defeating in terms of politics and impact: it could create an ICT4D silo that was isolated from development; all sidestream and no mainstream. And it would also be impractical given the focus and interests of ITU’s membership. Far better for ITU to stick to the readiness and availability issues that it does best – infrastructure, standards, access, bridging the digital divide – and instead to strengthen UNGIS with its own clear and independent mandate, funding, and secretariat. It would also make sense to draw other and emergent UN actors into UNGIS, such as Global Pulse. 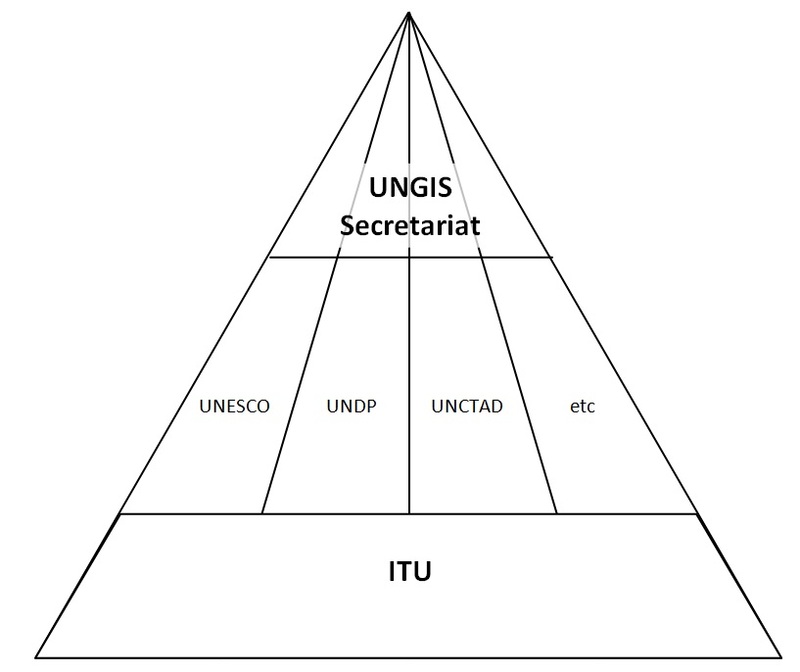 This would create an appropriate ICT4D structure within the UN system (see figure below) with ITU providing the broad foundation of ICT expertise, and UNGIS providing the hybrid spearhead that connects out to all of development. This would also ensure one further essential aspect of ICT4D’s future within the UN system, which is the continuation of WSIS beyond 2015. ICT4D drew attention, money and other resources at the turn of the century because it was associated with a compelling narrative. Albeit via a variety of terms, we foresaw the creation of an information society in developing countries; delivering the e-fruits of the global North to the global South. 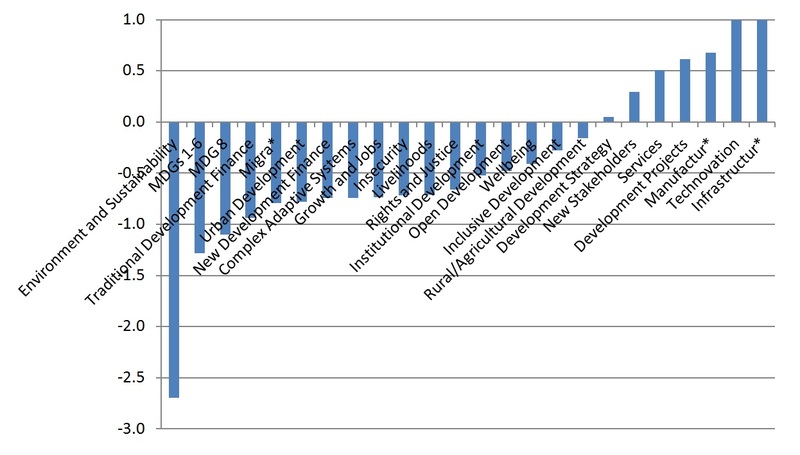 At present, we have no such ICT4D narrative for post-2015 development. The technology has fragmented with ICT4D struggling to keep hold of mobile, broadband, cloud, social media, smartphones, etc. The development goals and sectors that ICT serves are sub-fragments within economic, social, political and environmental fragments. Having never really gone away, it is hard for ICT4D to really reinvent itself with a reinvigorated sense of what an “information society” is and why it matters. But it should at least try. The World Summit on the Information Society (WSIS) process – the global node for ICT4D policy and practice – is publishing materials on its “beyond 2015” vision. But as yet these have little to offer. There is no defined core of an information society, just a sweeping up of the many fragments in the hope they might amount to something worth pursuing. The notion of an information society is qualified: in a number of places it must be “inclusive”; at one point it must be “people-centric, inclusive, open and development-oriented” (did someone forget to add “sustainable” to that list?). The erosion of vision is in some ways understandable because ICT4D stood well ahead of actuality in the early 2000s, offering a clear and different future destination. Over the years, reality in developing countries has started to catch up but WSIS has not maintained its headway: it has moved from casting visions to reflecting realities. WSIS has also fallen victim to a path dependency that keeps it within existing tramlines: a future of the same old action lines, and a conservatism that leads to repetition of increasingly-stale incremental formulations instead of embracing transformative new thinking. If path dependency is typical of institutionalised processes then fragmentation of core concepts is typical of multi-stakeholder processes: it is easier to keep adding phrases to please particular constituencies. But it means “information society” resembles the mule in Buckaroo – increasingly over-laden, and with the only solution that it must throw off all of these loads and boil down to a more singular and coherent vision. ICT4D could try to join another’s army, looking for a central role within the core narratives of post-2015 development. But those narratives are not yet clear – perhaps sustainable development; perhaps inclusive development – and narratives of “sustainable informatics” or “inclusive informatics” might give ICTs a marginal not central role in development. They would, nonetheless, be worth developing: the questions “where do ICTs fit into a sustainable development agenda?” and “where do ICTs fit into an inclusive development agenda?” remain unanswered. ICT4D could try grabbing someone else’s flag, claiming the data revolution as its own, and carrying that forward at its head into post-2015 discussions. It won’t be a comprehensive narrative, but at least it would be something that smells of fresh paint. ICT4D might try to develop its own internal narrative. The two candidates so far have barely sputtered, let alone caught fire. “Development 2.0” – the ICT-enabled transformation of development processes and structures – remains a marginal concept but one worth further investment given transformative development is a third possible narrative of the post-2015 agenda alongside sustainability and inclusivity. “Open development” has, thanks to IDRC, had more thought and work put into it and – another plus – it reaches out well beyond the technology. But that is also its downside: it does not yet resonate as an ICT- or even informatics-related narrative; and it suffers from conflicting meanings (the World Bank’s definition of open development is narrowed to open data and its impact on transparency and accountability; IDRC’s definition is more ambitious and potentially paradigmatic). All that can be suggested at present, then, is exploratory moves to look for an overarching narrative. The future role and structure of ICT4D policy and practice may well depend on how far forward those moves are able to explore.